We’re not even in the water yet, but already my heart is pounding in my chest. I’m on a boat about 2 hours from Cancun, on the perimeter of a circle of dozens of other boats filled with eager tourists. 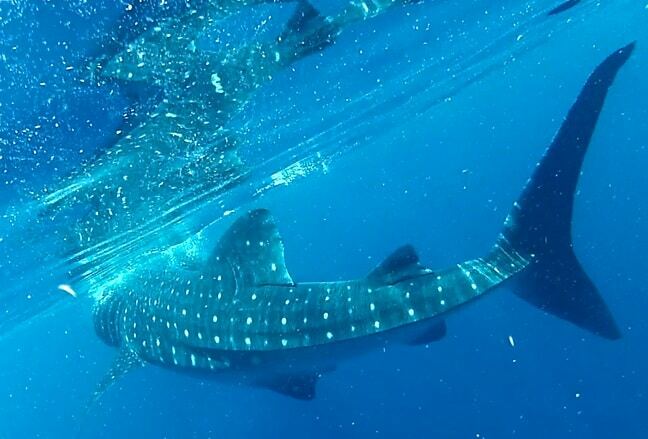 Like my 12-year-old daughter and I, they’re all here for a singular purpose: The once-in-a-lifetime experience of Swimming with Whale Sharks, the largest known fish species in the world. Though the glare of the morning sun on the water is nearly blinding, the 35-foot, 20,000-pound whale sharks aren’t difficult to spot. In fact, their hulking forms are everywhere we look, swimming in slow, lazy circles to filter-feed on krill and plankton at the surface, seemingly oblivious to our presence. Thankfully, our captain stays far away from the other boats, so that when one of these gentle giants swims near we will have them all to ourselves. As he brings the boat to a halt, a massive whale shark swims straight for us. He looks as wide as a VW Beetle, and as long as a school bus, gliding effortlessly with his mouth wide open. At the last second his spotted form swerves past us, changing directions surprisingly quickly with a mere flip of his tail. I’m 6’2″ and built like a linebacker, but suddenly even I feel very small by comparison. The waters off Mexico’s Yucatan Peninsula were the site of the largest gathering of whale sharks ever recorded. 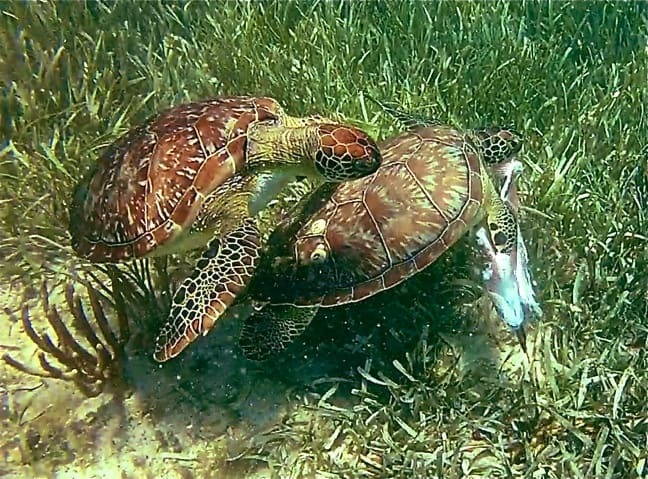 More than 400 of them were spotted feeding on spawn from the little tunny (a type of tuna) off the coast of Isla Mujeres in 2011. As newspaper articles, TV reports and YouTube videos began to spread the word about this amazing annual afuera (or gathering spot), thousands of nature-loving travelers were attracted to the area, and a bustling ecotourism industry was born. 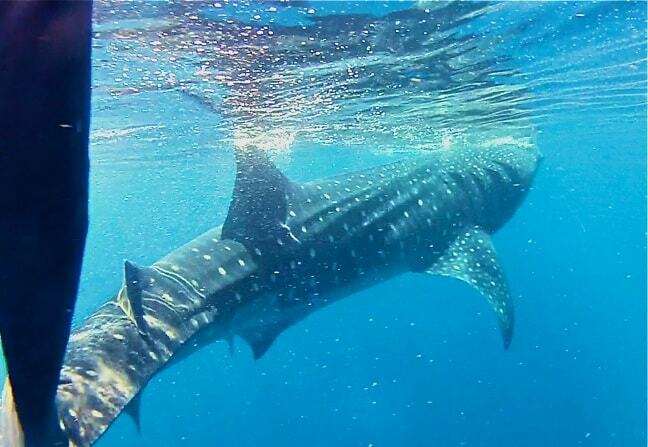 There are now around 200 boats in the Cancun area licensed to lead whale shark tours. With each boat carrying two to 10 passengers at a time, that means hundreds of tourists descending on the afuera daily during peak months, from June through September. Luckily for us, we’ve arrived fairly early in the season, and there are only a few dozen boats within sight. The remarkable growth of the area’s ecotourism industry has led to problems ranging from tourists riding on whale sharks to increased animal injuries from boat propellers. With the location of the annual afuera falling outside marine reserve boundaries, it remains unclear which state or federal agency should be responsible for whale shark conservation. The big problem is that the proximity of Cancun assures that tourist numbers will continue to rise. And while each tour operator may have the best of intentions where the whale sharks are concerned, their competing interests may ultimately overwhelm their common goal of protecting this natural treasure. Watch Out for Their Tails! Fortunately, our VIP Holbox guides are conscientious about teaching visitors the rules. A licensed guide must accompany anyone swimming with whale sharks in Cancun and the surrounding areas. No more than 2 swimmers and a guide should be near a given animal at any time. You should never touch a whale shark, and keep a distance of 6 feet. You’ll also want to watch out for their tails, which can whip unpredictably. My daughter has been fascinated with marine life for as long as I can remember, since early childhood excursions to Atlanta’s Georgia Aquarium fueled fantasies about undersea adventures of Little Mermaid proportions. Nearly every picture she drew was crowded with colorful dolphins, whales, rays and octopi. 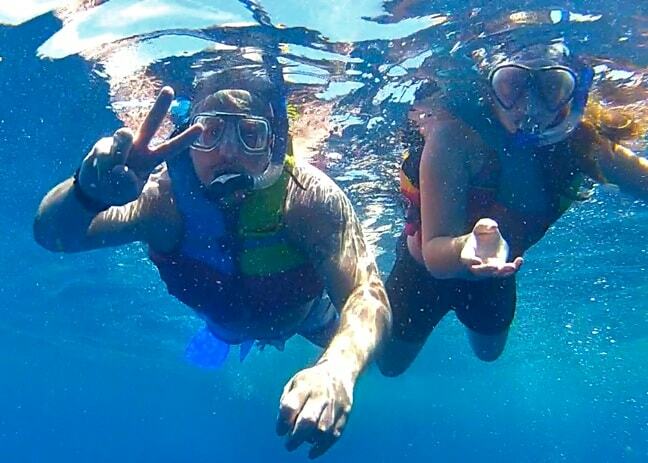 By the time she was five, I was taking her on trips that would make these aquatic dreams come true. We swam with dolphins and nurse sharks in the Bahamas, snorkeled with parrotfish in Aruba, studied marine science at Florida’s Sanibel Sea School, and assisted with research on the effects of climate change on coral reefs at the Bermuda Institute of Ocean Sciences. Along the way, we learned more about marine conservation and the delicate balance of aquatic ecosystems, bringing the ecological lessons she learned in school to life. Lately she’s been talking about a budding interest in becoming a marine biologist when she grows up. 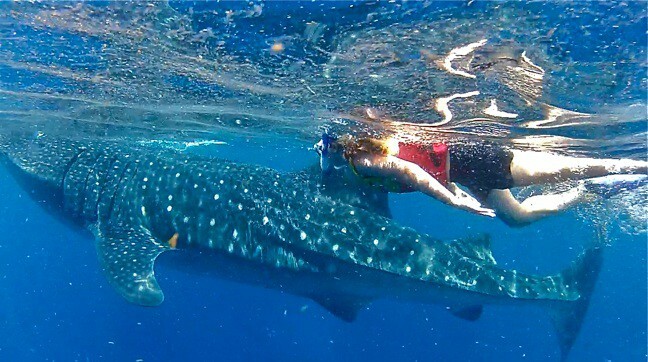 So our trip to the Yucatan Peninsula is as much about encouraging her to pursue her passions as it is about swimming with whale sharks. Of course, dreaming about something and actually doing it are two different things. As we watch other pairs of passengers strap into their life preservers, masks, snorkels and fins, and jump into the water, I sense my daughter’s anxiety building. Words can’t adequately prepare you for being just a few feet from a wild animal more than eight times your size. And, since feeding whale sharks swim at speeds of around 5 miles per hour, keeping up with them is definitely an adrenaline-charged action sport. Suddenly it’s our turn. We wait for the massive creature to swim parallel to our boat, then one guide encourages us to jump in the water with an urgent, “Go! Go! Go!” Another guide grabs our hands and swims us toward the whale shark, pumping our fin-powered legs as fast as we can to keep up. As my daughter’s speed matches that of the whale shark, I find myself overwhelmed with elation. For a moment time seems to stand still, and I see everything with crystalline clarity: The brilliant blue of the water, the rays of sunlight making the spots on the fish’s back seem to glow, the schools of tiny fish being sucked into the shark’s gaping maw as he glides effortlessly along the water’s surface. It’s an incredible moment and, as soon as it’s over, we can’t wait to do it again. Each duo gets three turns to swim with whale sharks, and each round feels more comfortable and rewarding than the last. By the time our all-day tour is over, we’ve also seen a pod of dolphins frolicking in the waves, and swam with gigantic manta rays, two adorable sea turtles squabbling over a fish head tossed overboard by another tour boat, and a cornucopia of colorful tropical fish. Only time will tell if Mexico will manage its world-renowned whale shark population responsibly, with an eye towards future sustainability. 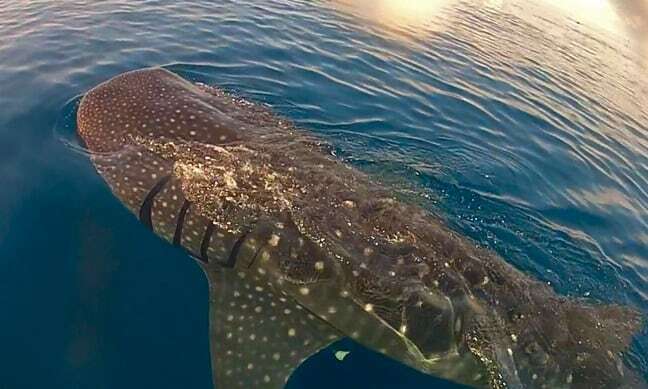 But swimming with whale sharks in Cancun is a humbling experience that ultimately provides perspective on the fragile balance between humanity and nature, and ensures you’ll become passionate about preserving these majestic creatures for the generations of travelers to come. 1) By law, you must be accompanied by a licensed tour guide. 2) No more than 2 swimmers and one guide should be near an animal at any time. 3) Keep a respectful distance of around 6 feet from the animals. 4) NEVER touch the whale shark, or try to ride it. 5) Stay away from the mouth (which has powerful suction) and the tail (which may whip unpredictably).